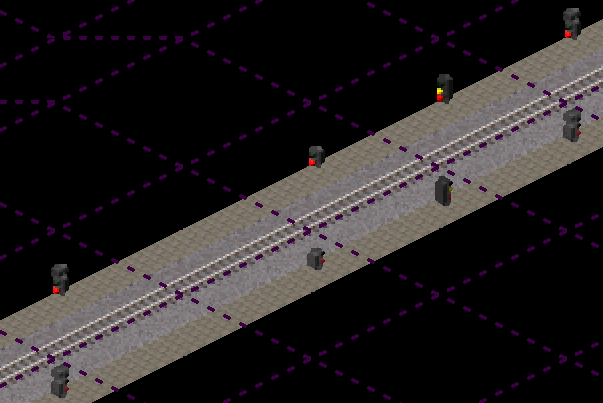 One of the projects on which I have been working for Experimental is enhancing the signalling system. A byproduct of that is the need for new signal graphics, on which I am currently working. I am taking the opportunity to produce a complete new set of signal graphics, properly aligned for left-handed use, and suitable for Standard as well as Experimental (indeed, some of the graphics, particularly for the long-block signal, may not be used in Experimental). # TODO: Change the name and graphics of this more accurately to represent token block signalling. The image files are in this directory. I shall be adding more signal graphics presently, including a greater variety of different types of signals for different historical eras. Hi james. This reminded me to continue my work on signals. Since ma patches to make left hand signals better, there is a new dat file option to set the offset, so the signals work well for both right and left side. I want to port it for experimental, but recently I prefer to spend my free time without a computer. I think that the offset code is present in Experimental, as I have backported most of the recent changes to Standard. However, changing the offsets is not enough for semaphore signals to be made left-handed, as the semaphore arm will be facing in the wrong direction if it is based on a right-handed graphic. Ok. I did not check the latest updates. You are right with the semaphore. But I take that as a minor issue. More iportant is that the base of signal will be on reasonable place and not somewhere on another tile as it was before. And Light signals and roadsigns will be perfectly ok on both sides. The sources are in this commit. Github commit here. (This also contains missing graphics from the previous upper quadrant signals). The lower quadrant signals, which were the predominant type on all lines before 1924 when the upper quadrant signals became the norm everywhere apart from the GWR, come in a number of varieties representing (in a highly simplified form) the often forgotten historical progression of the signals. 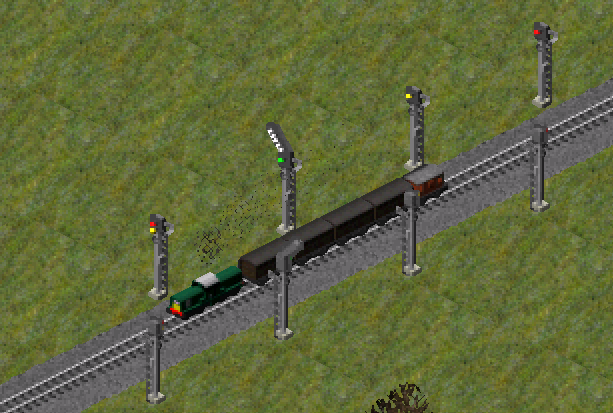 Signals before 1880 have white instead of green "clear" aspects, and distant signals (pre-signals in Simutrans terminology) before 1918 have a notched red arm with red light; only after 1918 was the yellow arm/light introduced. 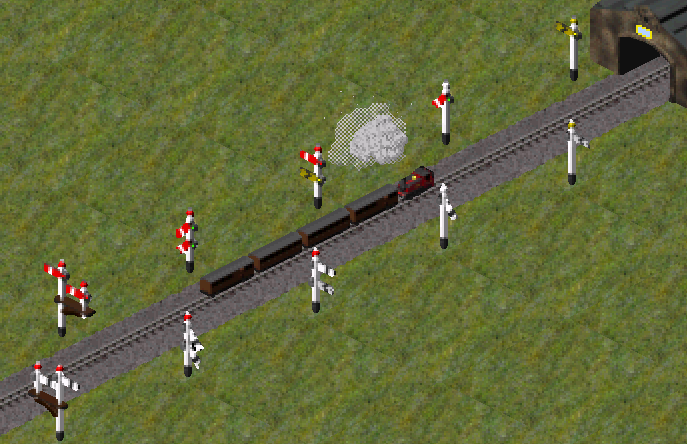 Somersault signals (from the G. N. R., introduced as a safety measure after the Abbot's Ripton rail accident), ringed and other specialist shunting and junction signals are excluded for simplicity. 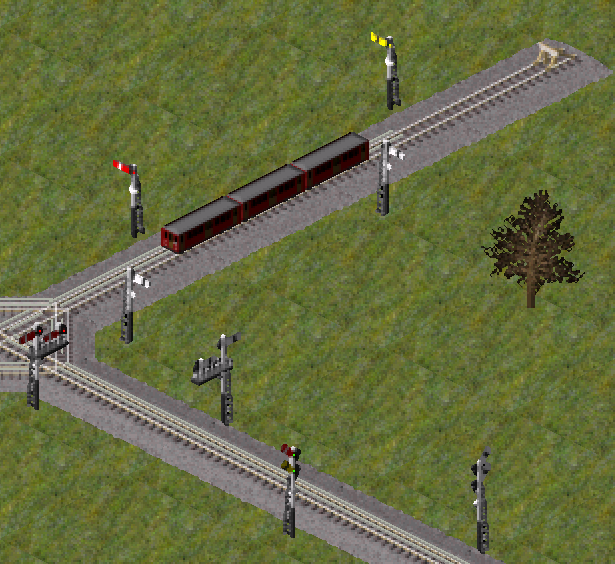 To aid distinction, the red arm distant signals are shown with a white finial ball, whereas the stop signals are shown with a red finial ball. In reality, both types of signal had either colour of ball. 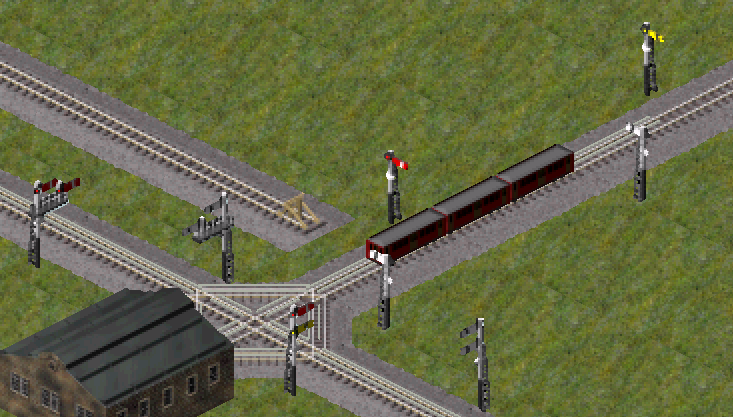 Apart from one single signal on the Lynton & Barnstaple, installed shortly before it closed, narrow gauge railways hardly, if at all, used upper quadrant signals so far as I have been able to find, so I do not propose to draw upper quadrant narrow gauge signals. These short post signals, however, will be usefully re-purposed as early underground signals. The Github commit with the sources is here. Here is the Github commit. Here is the Github commit with the fix. And here is the Github commit with the sources. Here is the Github commit for them. I find those very hard to see. 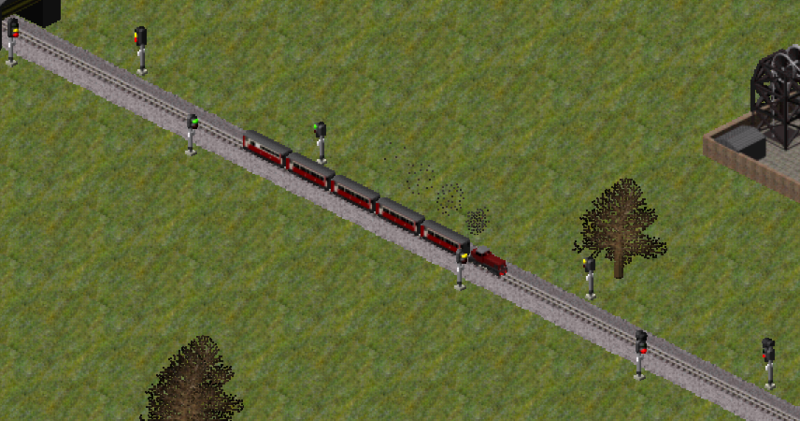 Perhaps if you could increase the colour saturation of the dark red stripes just a tad, it would improve quite a bit. I hope that would not compromise historical accuracy too much. The reason that these are a bit dark in this orientation is that these signals, unlike the previous hand-drawn signals, are shaded in the standard way. This orientation is in shadow, as you will see from the face of the rear carriage of the train also facing in the same direction. The signals are each provided with a bright point of light representing the lamps, however, when in the forward position. I was suspecting as much, however, I think for practicability a little cheating on the lighting could be possible without breaking the concept of shadow and without having them look like modern reflective paints. As it is, there isn't enough contrast to notice the signal position, at least for me. The bright point helps a little, it is just a bit too small. I think with it you are limited to special colours? Were you not, reducing the brightness a little and increasing its size a bit, perhaps twice would make it easier to see. This would not matter very much for other objects. However, it is quite important for playing the game to see very immediately in what state a signal is. Regardless of this small aspect, these signals are excellent work! I am convinced will set a new standard other paksets will strive to achieve in their future updates. Thank you for your thoughts. I am not quite sure how one would go about doing "a little cheating on the lighting" in a uniform and visually satisfactory way, however. Incidentally, have you tried clicking on the image to view it in full resolution? 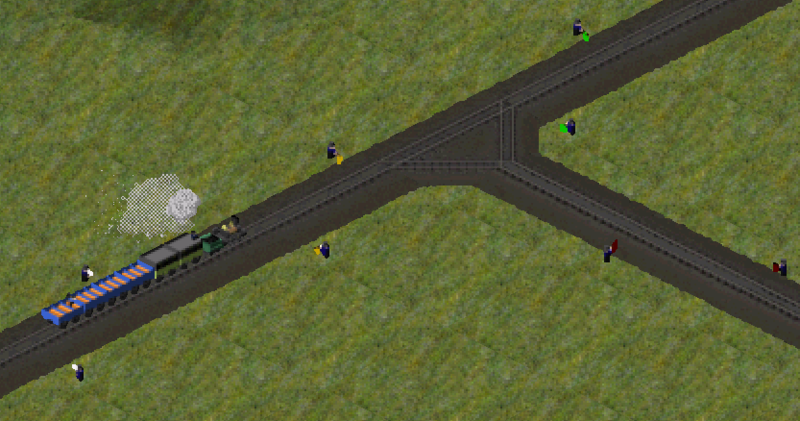 The forum by default shows a reduced resolution version which might make the signals seem harder to see than they really are. Here are some LED colour light signals, which are quickly replacing filament lamp signals. And here is the Github commit. 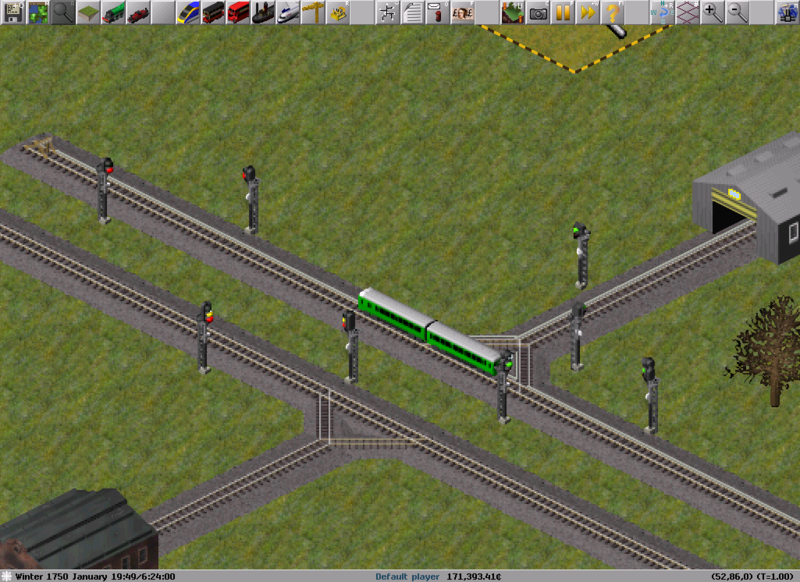 The flag signals are a little different to the others: "clear" is represented by no flag at all (this was before the era of failsafe signalling), except for the choose signal, which I have given a green flag (as pictured). There is no long block signal, as single line signalling was not really possible before the invention of the telegraph. 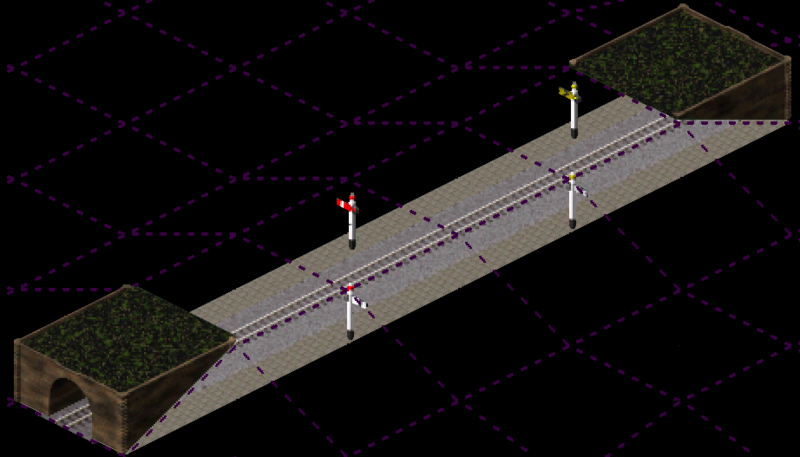 If the Standard version of this pakset really needs early long-block signals, I can produce some. 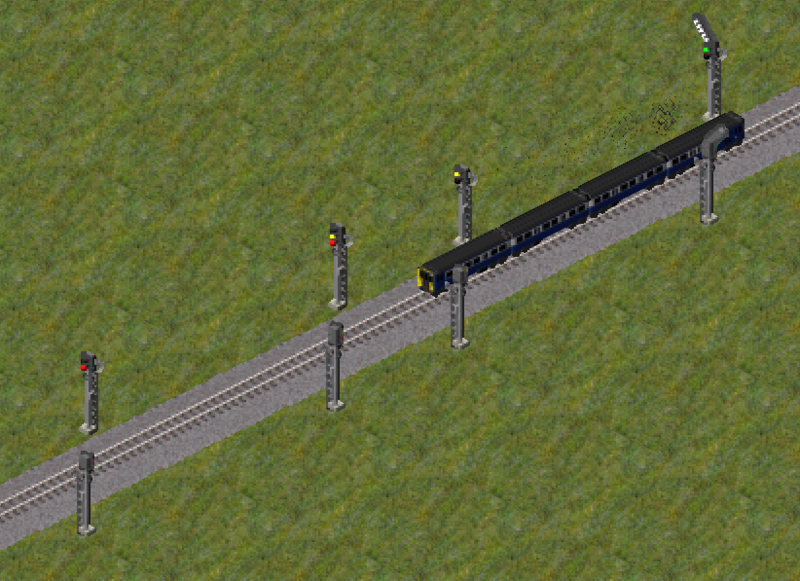 Here is the Github commit, which also contains some missing graphics from the LED signals. I have retained the yellow flag as the choose signal, although it has no historical prototype. Here is the corresponding Github commit. 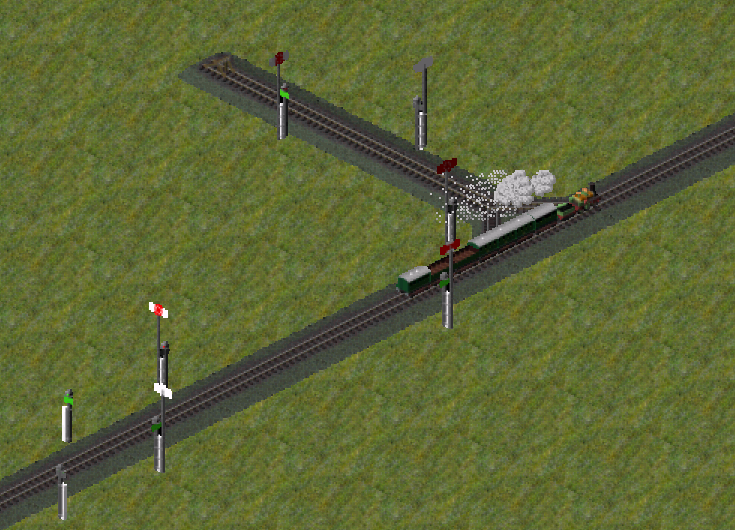 I could not find anything on vane junction signals, so the choose signal with the red bar is totally fictional. The relevant Github commit is here. 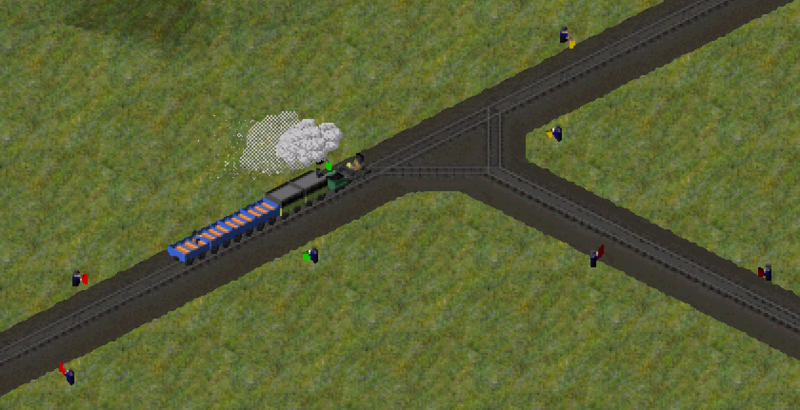 Because I am about to continue the work in overhauling the Simutrans-Experimental signalling system, the .dat files for these are likely to change in the future so as not to be compatible with Standard (currently, the .dat file format for signals is the same between Standard and Experimental). Different graphics in some cases may be needed for the forthcoming Experimental version. With that in mind, I think that there is much to recommend me packaging the new signals in their current state for use in Standard. Accordingly, here are all the images. The .dat file is here for standard gauge, here for narrow gauge. Please note that the images for these signal files are in the /images subdirectory of /ways, unlike the current signal graphics. James, it looks as though you have added many new signals. I'd rather keep things a bit simpler in standard - which ones do you recommend I keep? 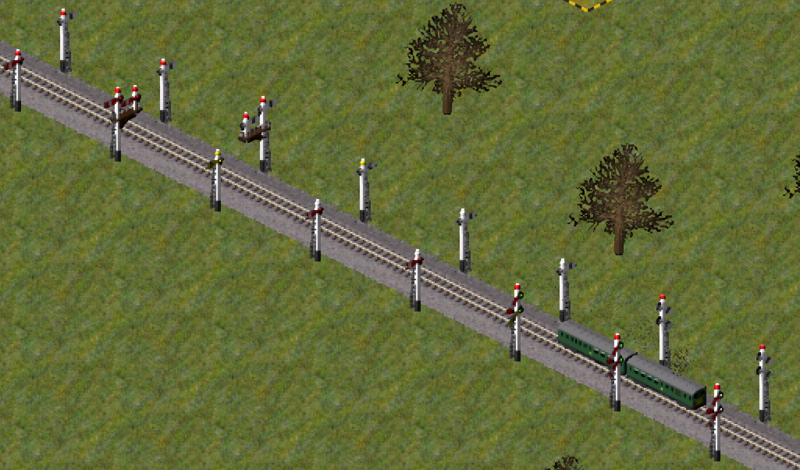 The links that I gave above are intended to be the set for Standard: all of the new types of signals specifically for the new features in Experimental are omitted.